The passes are high and difficult. The country is gigantic. You start for anywhere and it takes forever, and it is all climbing. But I love it. It is savage, grand and beautiful. 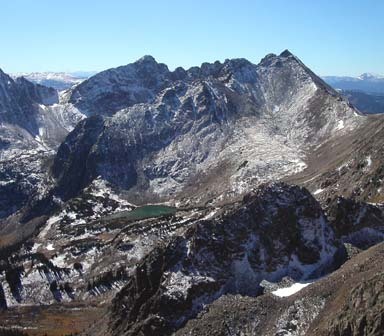 This hulky Gore Range Thirteener hides in the center of the Eagles NestWilderness. Just barely over 13,000 feet, Keller carries more stature than many peaks over a thousand feet higher. 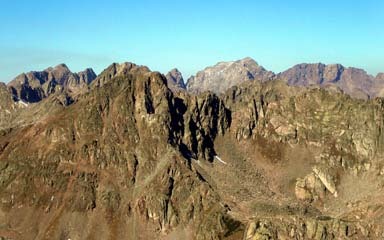 Keller is the highpoint of the ridge separating the North Rock Creek and Boulder Creek Drainages, and the summit is 0.8 mile northeast of the range crest. Welcome to the Gore Range! Depending on how you define difficulty, this may be the easiest route on Keller. The tradeoff between the Southeast Face Route and the East Ridge Route is that the Southeast Face Route requires a rigorous bushwhack, while the East Ridge Route requires some Class 3 scrambling on an exposed ridge. Read both route descriptions, then make your own choice. Start at the North Rock Creek Trailhead at 9,460 feet, and hike southwest up the North Rock Creek Trail. Enter the Eagles Nest Wilderness shortly after leaving the trailhead, cross the Gore Range Trail after 0.4 mile and look sharp for a side trail leading downhill to the left 1.7 miles from the trailhead. This turn is just before the main trail begins to climb across a steep, south-facing slope to reach the Boss Mine. If you find yourself gazing at an open view to the southwest of the upper North Rock Creek Drainage with Keller Mountain to the right of it, you have gone a little too far on the main trail. Leave the comfortable main trail, follow the short spur trail for 200 yards down into the belly of the basin, and consider your future. The next 2.3 miles of the route is a classic Gore Range bushwhack up the trailess North Rock Creek Drainage. For the uninitiated, Gore Range Bushwhacks are not like bushwhacks elsewhere in Colorado. In the Gore Range, you do not saunter gleefully through the open trees of a Bambi Forest. On a Gore Range bushwhack, be prepared to clamber laboriously over multiple crisscrossed log jams piled high by monstrous winter avalanches. On a Gore Range bushwhack, expect toget your feet wet while bogging around the marshes that appear unexpectedly between the log jams. On a Gore Range bushwhack, don’t be surprised if you study a half-dozen micro route choices for the next 100 yards, and discover that they are all miserable. On a Gore Range bushwhack, be prepared to go less than a mile an hour. 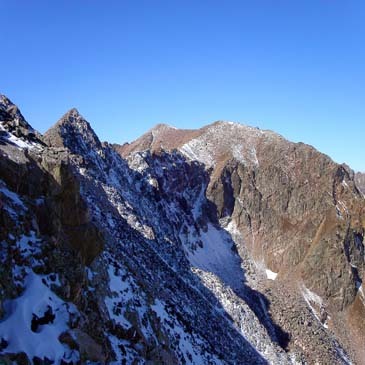 On a Gore Range bushwhack, be prepared to climb cliffs that mysteriously appear	in the forest. If it’s high summer, be prepared to fend off thousands of fiendish insects. In June, bring your snowshoes. The easiest Gore Range bushwhacks get a Class 2+ rating. Those that worry about the Gore Range being overrun by hoards of peakbaggers can rest easy, since the Gore Range bushwhacks will always safely barricade the splendors of the upper basins. For those that are determined that this is their route, bushwhack 2.3 miles southwest, slowly climbing above North Rock Creek toward Keller, and reach an idyllic meadow at 11,300 feet. This meadow shows as a significant flat area on the Willow Lakes Quadrangle, and it is midway between the unnamed lakes at 11,590 feet and 11,660 feet that adorn upper North Rock Creek. 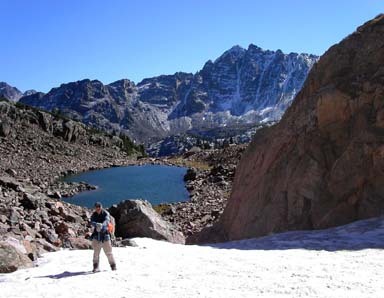 From the meadow, climb 0.3 mile north to the lake at 11,660 feet (see photo), and hike around the lake to its north end. Your arduous approach is over. Now for the summit climb. Climb 200 yards northwest up a gully (see photo), then climb 0.3 mile west up a small basin. When the basin gives way to open slopes, climb 0.3 mile north up steep slopes to Keller’s summit. Start at the North Rock Creek Trailhead at 9,460 feet, and hike southwest up the North Rock Creek Trail. Enter the Eagles Nest Wilderness shortly after leaving the trailhead, cross the Gore Range Trail after 0.4 mile and reach the beginning of the Boss Mine tailings at 10,200 feet, 2.0 miles from the trailhead. Before entering the mine tailings, bushwhack 0.4 mile north, and still in the trees, reach Keller’s east ridge at 10,840 feet. This bushwhack is easier and shorter than the bushwhack up North Rock Creek, but it is still arduous, since it is steep. Pick up a good trail on the ridge, and follow it 0.9 mile west, then southwest to treeline at 11,800 feet, where the trail ends. 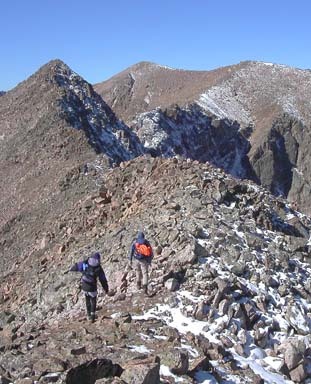 Continue 0.7 mile southwest up a rocky slope that narrows to a ridge, and reach the summit of Point 12,847. You may already feel like you have climbed a mountain, but the view ahead of Keller’s continuing, curvaceous ridge tells you that much work remains (see photo). Staying on the ridge’s southwest side, climb 0.25 mile west to Point 12,940, and consider your future, as the next 0.25 mile of the ridge is testy. Staying on the ridge’s south side, descend until you must climb down a Class 3 passage right on the exposed ridge crest. When feasible, continue contouring on the	ridge’s south side. When the terrain finally relents, hike 0.2 mile southwest to Keller’s summit. Ascending the East Ridge Route and descending the Southeast Slopes Route makes a comprehensive Tour de Keller that allows you to experience the vagaries and splendors of both routes. No matter how you climb Keller, the pristine positions and expansive alpine views will be your reward.